Oh what a wonderful day it is! It's a special time to thank some of the most important women in our lives - our dear mommas. I am so grateful and lucky to have the most kind-hearted, caring, wonderful mom. I created this card to say thanks, because she does so much for us, putting everyone before herself, and I never want her to think that any of it is taken for granted or not appreciated. When I think of all the gestures, big and small, my heart fills up so much, that it's hard to put into words how lucky I feel. So this card is sort of a way to express it - full of color and sweetness - it's how my heart feels when I think of my sweet momma! 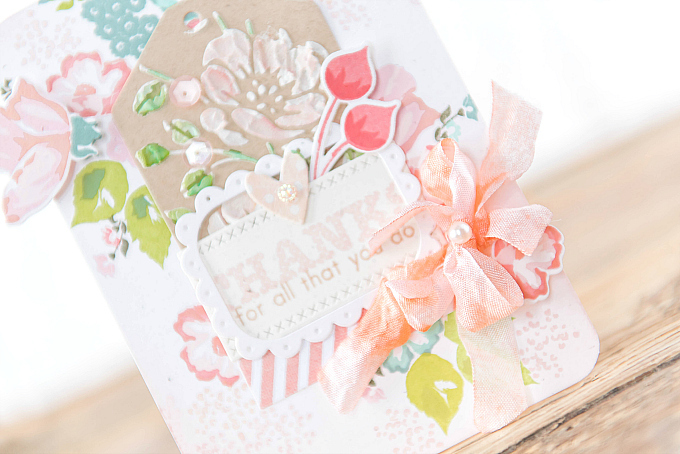 To start this card I used Sweet Blush ink to blend some ink onto the edges. I also used a dotted stamp to stamp a little background detail with the same color of ink. I used the beautiful Farmer's Market Florals from Papertrey Ink to stamp the floral clusters in colors of Berry Sorbet, Melon Berry, Sweet Blush, Lovely Lady, Ocean Tides, Aqua Mist, Simply Chartreuse, Green Parakeet, Olive Twist and Ripe Avocado. I also used the coordinating die to cut out some of the flowers and pop them up as an accent. I added a kraft tag, cut with PTI's Tag Sale Tag 10, as well as a white scalloped border cut with the same die. 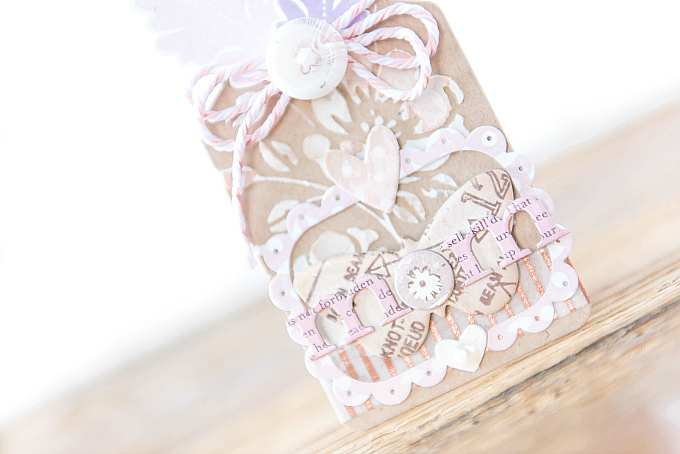 On the kraft tag, I used the beautiful Tim Holtz Roses stencil, with white molding paste from Golden. I then used some watercolors to lightly color the molding paste. For the sentiment, I used PTI's Polka Dot Parade #6 to stamp. 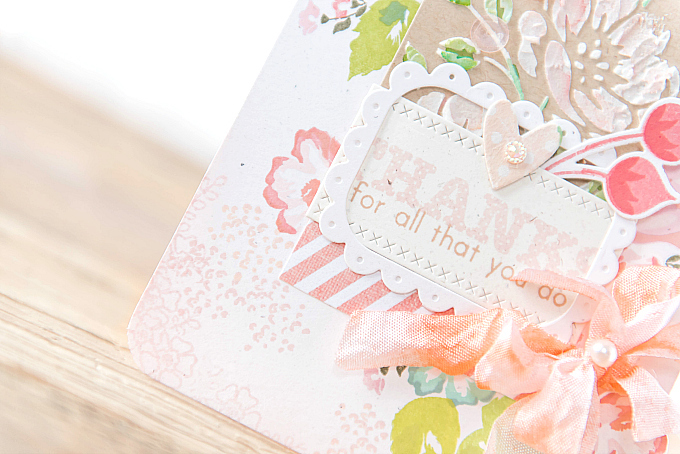 I added a berry sprig stamped and cut using Gran's Garden stamps and dies, in Berry Sorbet. At the bottom, I added a striped paper, and soft, romantic bow, along with a pearl, and my favorite pink iridescent rhinestones. 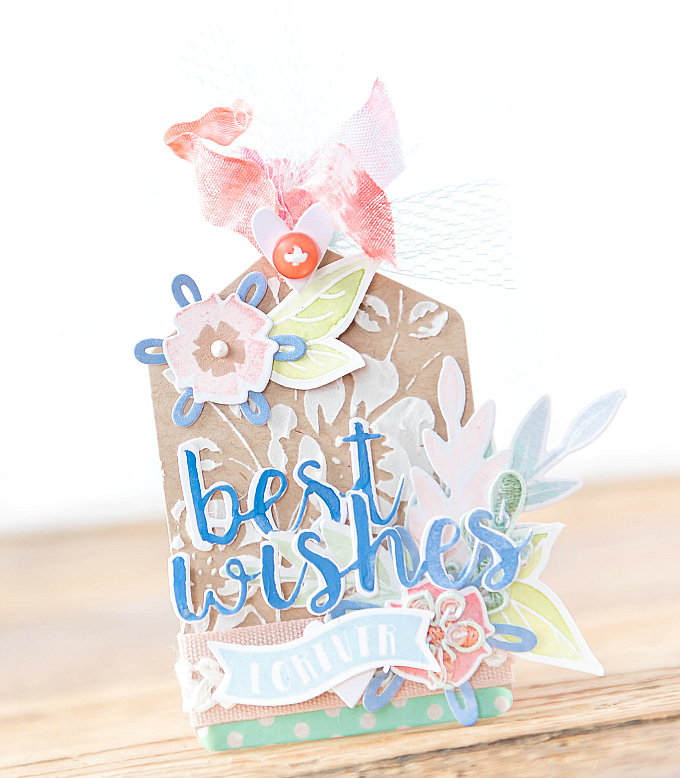 I used the same PTI dies to cut this tag and sweet scalloped accent. I also added another stenciled design, along with a bit of soft watercolor. 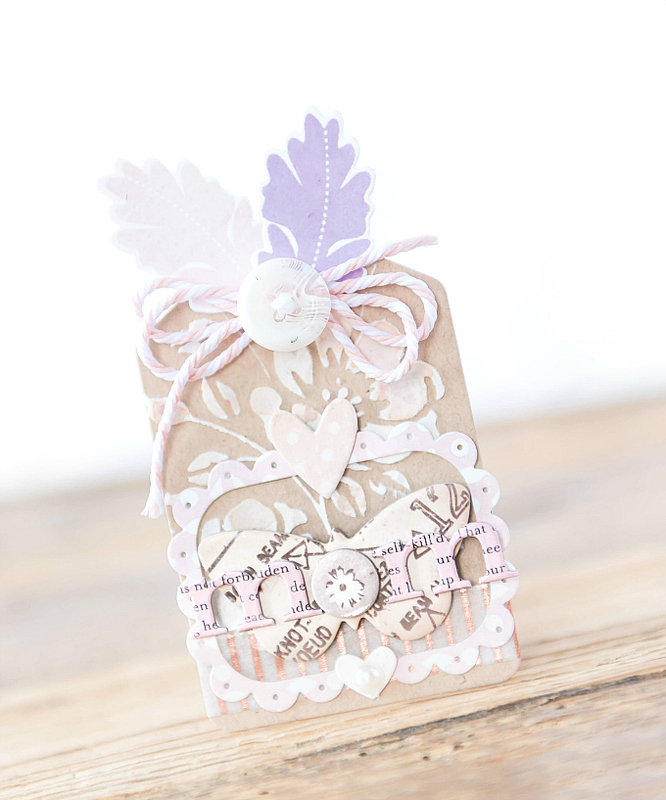 At the top I used PTI's Rosie Posie stamps and dies for the leaves, stamped in Lilac Grace and Winter Wisteria ink. 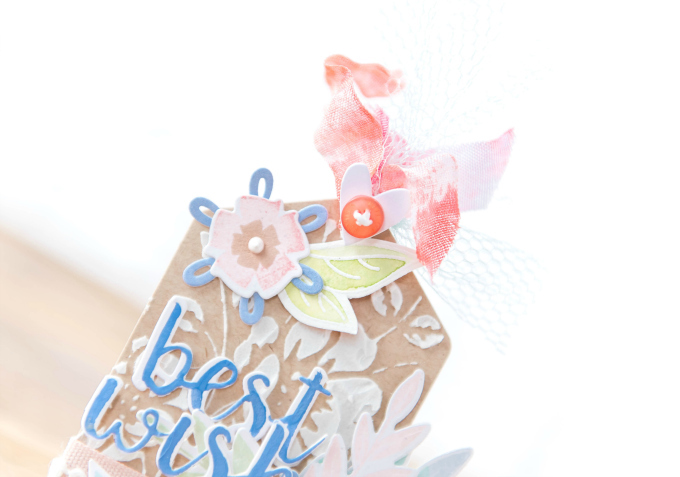 For the finishing touches, I added some chipboard accents in matching hues. I had a few supplies left over, so I decided to make one last tag for a future event - a bridal shower for a dear friend. 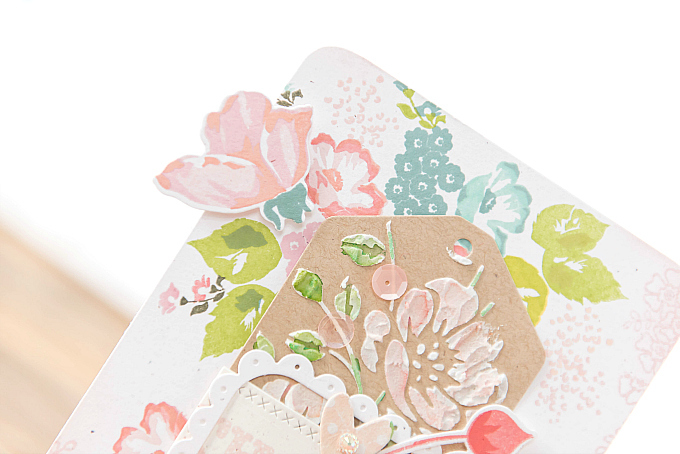 I started this tag much the same way, adding lots of floral details along the way. At the top. I added ribbon, organza, and little button. 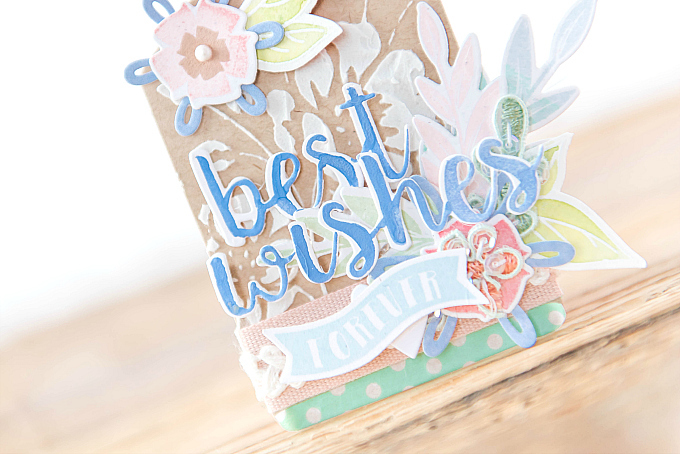 Just below that, I used MFT's Cause for Celebration dies for the sentiment, loosely watercolored with a bright blue hue. For the leaves, I used PTI's Gran's Garden stamps and dies, Peonies on Parade stamps and dies, and snowflake dies from PTI. Hope you are having a wonderful weekend and whether you're honoring your momma, or a momma being spoiled and loved by your family, I wish you a beautiful day! WOW!!! Stunning work as always! The color palette is so beautiful and the design is melting my heart! Have a wonderful day Ivana. I love your card and tags, as always!!! I marvel at how you add all the little details to your projects. Would love to have the eye for detail that you have. Your style reminds me lots of Melissa Philips over at PTI and I always admire her work as well. Thanks for the Mother's day happiness you send and I hope you have a wonderful day with your mom!!! Aw, Sadie, thank you so much! Such an honor to be compared to Melissa's incredible talent - wow!! Biggest thanks for always leaving such sweet notes for me - I appreciate it so much! Big hugs! Always takes my breath away when I come to your blog, Ivana--incredibly beautiful work! 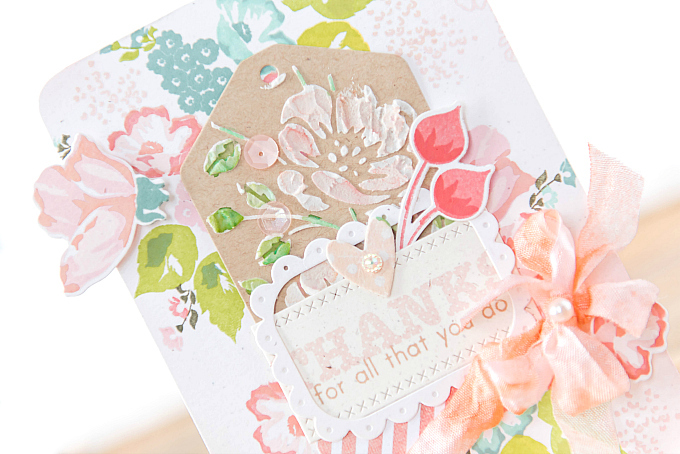 Your momma's card is amazing with the gorgeous stamping & use of the stencil! LOVE both tags--treasures for the recipients! You must not want to be on a DT as you'd be such an asset to any company & so much better than all the same people over & over! What an incredibly touching and humbling thing to hear, Greta. Thank you sooooo much for all of your kindness, I really can't tell you how much it means to me! I'm really hoping to work on the DT avenue of things a bit more - time is always such a precious commodity around here! 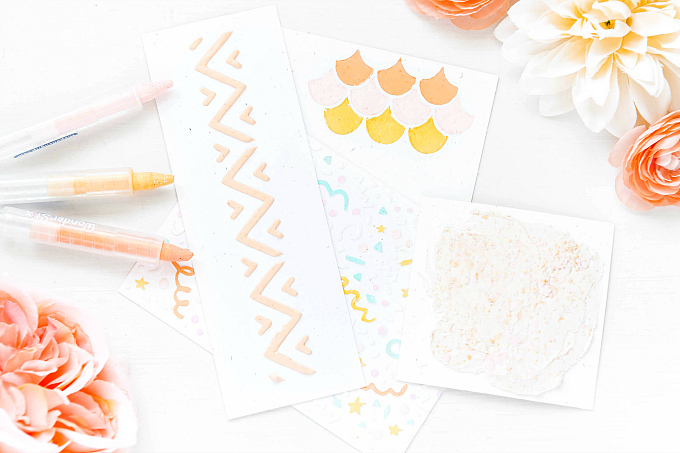 THANK YOU for your sweetness and for showering my blog with so much love! Sending many, many hugs!